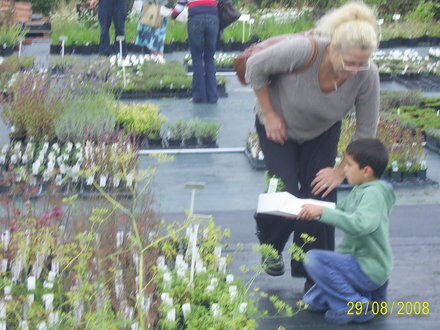 THIS IS ME WITH MY GRANDSON SAM AT ONE OF THE OPEN DAYS…HE LIKES TO GROW JEKKA’S STRAWBERRIES ! Usually, you can only buy JEKKA’S organic herb plants and seeds online via mail order, or at the flower shows that she attends, but five times a year JEKKA opens the doors and welcomes you to visit her organic herb nursery. Jekka’s Herb Farm Open Days offer a unique opportunity to browse amongst 600+ varieties of organically grown herbs, meet Jekka and the team, and pick up some expert tips and advice! There will be seasonal refreshments using locally sourced ingredients. So there’s no need to rush off when your tummy’s rumbling. September 3rd, 4th, 5th … 10am – 4pm. FREE Entry on Friday…£2 Sat/Sun. 12 – 12.45 pm Herb Workshop with Jekka McVicar – pre-book online (entry by ticket only)…workshops take place at midday on each open day and last approximately 45 minutes. Farm tours take place at 10.30am and 2.30pm on each day, lasting approximately 20 minutes – no booking required. N.B. Entry is free if you have pre-booked for a workshop, and also for Catalogue holders, members of the RHS, members of the Herb Society, West of England Herb Group and the Soil Association. Take advantage of expert advice and insider tips from Jekka and the team, and learn all about the intricate workings of an organic herb farm. A special herb display is created for each open day. These demonstrate how different herbs complement each other and what looks good at different times of year, as well as offering planting suggestions for you to recreate in your own garden. You can place orders for collection at any open day, simply allow at least 48 hours notice. Visitors in wheelchairs are welcome – although some of the ground is rough, it is accessible. Located north of Bristol, just off the A38 near Thornbury. Postcode is BS35 3SY for Sat Nav drivers…the farm is also signposted off the main routes during open days. Please note: This is a working farm with some rough ground, so care should be taken when walking round the site. No dogs and no smoking is allowed. Eating and drinking is only permitted in the clearly marked area. The farm is closed to the general public at all other times, unless prior arrangements have been made. Previous post: AMATEUR GARDENING- MARCH 27TH. FIVE PAGE SPECIAL FEATURE ON JEN'S GARDYN !!! Thats interesting jj. I only wish I lived near Bristol, I've always admired Jekka, she's a one-off. Lovely to see children interested in growing things. Thanks jen, i only live a short drive away, fed up with weather, mite pop in and visit jekka, brill! thanks again. Thanks for the info, too far for us unfortunately. Glad you had a lovely day. NGS OPEN DAY, HANHAM COURT, HANHAM ABBOTS, BRISTOL.17TH FEBRUARY 2010. RICE FIELDS OF JAPAN … AMAZING.